This month we are featuring one of the monuments of Lucknow in Uttar Pradesh and Kondapalli toys of Andhra Pradesh. Built like a fort, this huge and elegant building is also called the Asafai Imambara. This building was built in a famine relief programme in 1784 by Nawab Asaf-ud-Daulla. The structure took six years to be completed. Just as we enter the building there is a hall almost fifty metres long and 17 metres wide. The architecture of this 15 metre high room is very unique and unparalleled. Here the Nawabs used to hold their ' Darbar ' or their public hearings. It is said that this hall is the world's largest arched room without any pillars. The upper part of this building is in the shape of a honey bees comb and is surrounded by the famous 'Bhul Bhulliya'. This has got numerous steps and there are 489 door less galleries which are similar in appearance. People can get lost in these galleries. The largest of these mazed rooms and galleries has something very special about it - that when a paper is torn at one end, it is distinctly heard on the other end. The Bada Imambara also houses the tomb of Asaf-Ud-Daulla. 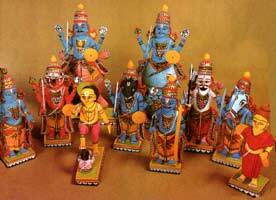 Kondapalli village is the production centre of the famous Kondapalli toys which are made with a light wood called "Poniki". It is 16 kms. away from Vijayawada. The toys are made in the likeness of Gods, Goddesses, birds, animals and houses. They are available in the major temple towns and handicraft centres.